There were other spooky similarities. Harriet attended a small private school like mine; she had loving-but-distracted parents like mine; and she was cared for by a straight-talking, tea-drinking nanny… again, like mine. Or kind of like mine. My nanny sneaked Irish whiskey into her tea and chain-smoked Marlboro Reds while my parents were at work. Oops. Similarities aside, Harriet’s story diverges from mine in some significant ways. My dad was a cautious, mild-mannered civil engineer, not a martini-swilling, Mad Men-esque ad executive, and my mom – a hard-working children’s wear rep – was too busy schmoozing with customers to meet her gal pals for afternoon bridge. We also didn’t live in a lavish, three-story townhouse across the street from Carl Schurz Park, or employ a full-time cook. Our apartment was more humble, located in a redbrick building opposite the Queens Midtown tunnel, and the only one who cooked was my mother. Oh, and I didn’t have a spy route. The possibility of getting caught – and possibly arrested – was too much for my nervous stomach. I did have one advantage over Harriet, though: Through my bedroom window, I could watch the Ringling Brothers circus animals make their yearly pilgrimage through the tunnel from Queens to Manhattan, en route to the big top at Madison Square Garden. And of course I chronicled the marvel in my journal. How could I not? Like Harriet, I loved to write. It’s no surprise, then, that Harriet the Spy resonated in a way no other book had. The reason, I suspect, is that Harriet was the anti-Melissa. She was bold, and brash, and fearless, and her notebook entries (or “dossiers,” as her mother called them) were as outrageous as they were insightful. Whether describing her friend Sport’s lack of early-morning hygiene (“He has funny little dry things around his eyes”), or her sixth-grade nemesis Marion Hawthorne’s obnoxiously awful behavior (“If Marion Hawthorne doesn’t watch out, she’s going to grow up into a lady Hitler,”), Harriet kept it real. I kept it real in my journal too, but my childhood musings were as bland as Farina compared to Harriet’s on-the-edge exploits. To be fair, I didn’t have the advantage of sneaking into rich ladies’ houses and hiding in their dumbwaiters, but that was okay. Harriet could be audacious for me. 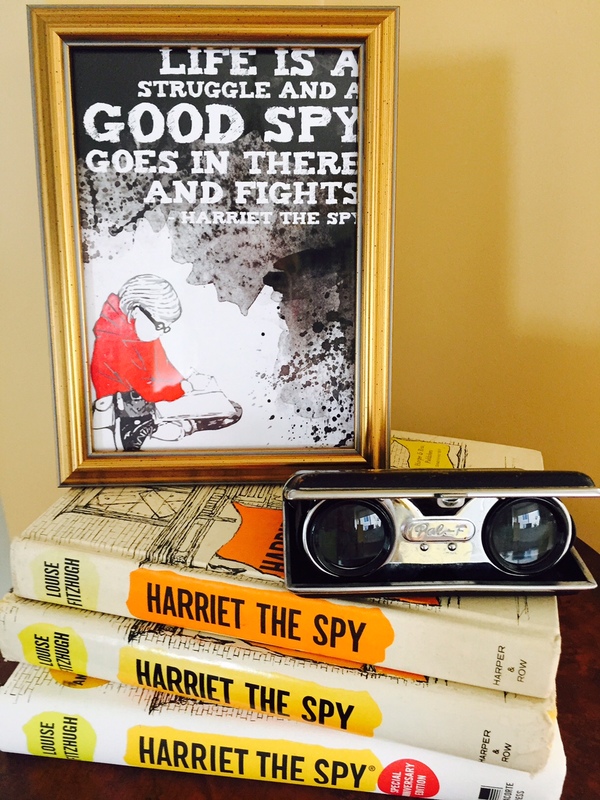 Over time, Harriet the Spy became more than a book I read for comfort and adventure, year after year. It was a part of my identity, the key to who I was: An only child. A daughter to loving-but-distracted parents. A friend. A native New Yorker. And now: Melissa with two s’s. A wife. A mother. A writer. Melissa Roske is a New York-based writer of middle-grade fiction. Her debut novel, KAT GREENE COMES CLEAN, will be published by Charlesbridge on May 2, 2017. Find her on her website, on Facebook, on Twitter, Instagram, and Goodreads. I thrilled to Harriet as a kid. I remember her tomato sandwiches. As an adult I cringe at her audaciousness. Yes! Her tomato sandwiches are legendary! Thank you for sharing your wonderful story! My goodness it was very nice, thought provoking and inspirational. So many of us identified with Harriet the Spy, but none of us can claim to have a similar name! What a treat! For sure, like you, I would have thought she was my hero, the strength I was lacking, but wanted to have… she “did” make us all feel with her neediness that if we are determined then courage is within us to pursue the truth and be victorious. I haven’t read Harriet the Spy since I was young, you have made me want to pick it up again for inspiration. Have a great day! Thank you for your lovely comments. Yes, please reread this amazing book. You won’t be sorry. And thanks again for reading! This is amazing because I thought Harriet the Spy was about me. I am reading it again. The first time it was read to me by my fifth grade teacher. I never forgot it. Now as an adult and a writer, I truly appreciate the books. I’m so glad you feel the same way, Cynthia. Thanks for reading! I assume you watched Agent Carter? You would love it, I think. Sorry for the slow-pokey reply – just saw this. No, I have not watched Agent Carter. Should I? Absolutely. First Season is best. This was so insightful. Sad to admit that I haven’t read the Harriet books. I’d better get busy I have a lot of catching up to do.